Grammy®nominees Peter Kater and Michael Brant DeMaria present their first studio collaboration with eight improvisational “sound poems” that arose from a shared space of deep listening and love. These beautiful piano and flute duets are ideal for meditation and the healing arts. Nature expresses a deeper kind of music that can only be heard when we quiet the mind, open the heart, and step into silence. Heart of Silence presents the first collaboration between Grammy®-award nominees Peter Kater and Michael Brant DeMaria. Pairing Kater’s elevating piano with DeMaria’s soothing Native American flute, these soulful improvisations invite us to explore and evoke the mysterious depths within each one of us. 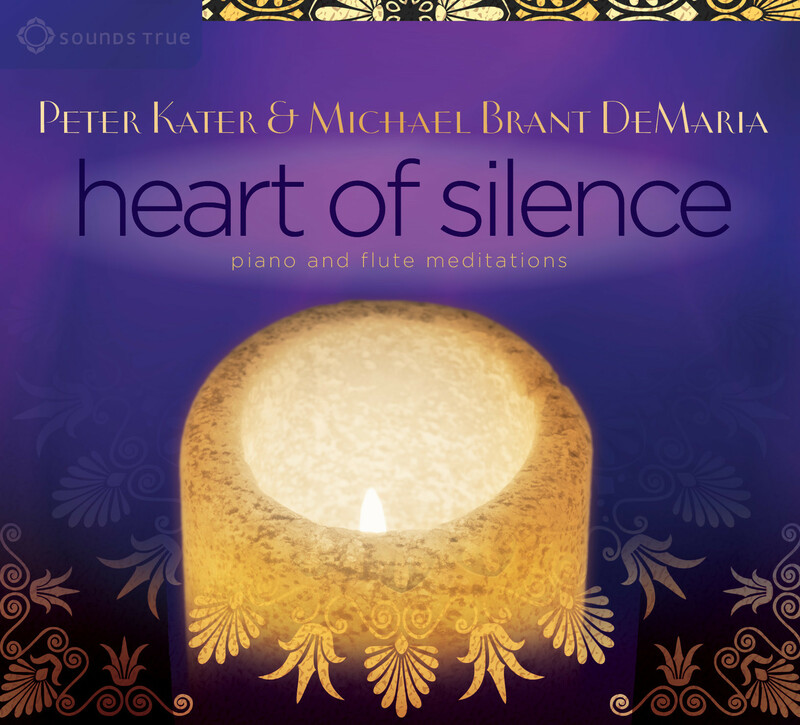 "Heart of Silence" is the first collaboration by pianist Peter Kater and Native American flutist Michael Brant DeMaria. With fourteen Grammy nominations between them, this album seems very likely to place both artists firmly inside the Winners Circle for 2015. Both are widely-known for their deeply spiritual improvisations and the music for this album was created during meditative sessions. Each track is a free improvisation performed without any rehearsals or pre-planning. Kater and DeMaria chose which key they were going to play in and started recording. In turn, the intention is for the eight tracks to be listened to as meditations. The inspiration for "Heart of Silence" was DeMaria’s experience of having his mother die in his arms only to be revived by emergency cardiac surgery. Profoundly touched and changed by the experience, DeMaria wanted to find a way to express that experience musically - the mix of grief, connection, and love that was both ominous and comforting at the same time. He had three custom deep bass flutes made for this project, searching for the lowest sound he could find. The flute with the lowest tone used on this recording is five feet in length - a sub-bass A minor flute - and only one other such flute exists. It becomes a voice from the depths and a drone instrument to express the inexpressible. DeMaria says that his whole body vibrates when he plays this flute. Blended with Kater’s soulful piano, the duo has created a masterpiece of simplicity and profound meaning that should touch the spirit of anyone who experiences it. The music itself is very open, free, and deeply emotional. The sound of the deep bass flute is dark but also very warm and comforting. The percussive quality of the piano contrasts beautifully with the more rounded tones of the bass flute. Kater has often recorded and performed with Native American flutists, so it is no surprise that this album works so well. However, this is far from a duplication of previous work - DeMaria has his own musical style and message to convey - and the duo has created an album that is unique and very personal. Although there are short breaks between the tracks, the album plays as a cohesive one hour listening/meditating experience and yet each piece stands alone as well. Sure to be one of my Favorites for 2015, "Heart of Silence" is available from SoundsTrue.com, Amazon and iTunes. Very highly recommended! As the album’s subtitle, “Piano and Flute Meditations” indicates, the music blends Peter’s elevating piano with the soothing sounds of Michael on a variety of Native American flutes. In describing the recording and creative process, Michael shares: “Each track was a total free improvisation - no rehearsals - no pre-planning. We just decided on what key to play in and started recording. We both have a similar process of recording - by allowing the music to emerge out of silence - letting go of the logical strategic mind, and allowing the spirit of the moment to guide us. This description certainly proved to be accurate as the album opened with the title track. It is indeed quite spacious and meditative and took on a particular significance for me as I listened and reflected on the gossamer veils that separate life and death, which is a focal point in the inspiration behind this album. In my full-length review of this album on Music and Media Focus, I covered this fascinating back-story in depth. The next track, “Radiant Dawn,” has more motion, driven by Peter’s rolling arpeggios that flow like a river with Michael’s higher pitched Native flute soaring above it. The sound of the low bass flutes sometimes have a similar role and effect as a drone instrument like a didjeridoo, as it does on the gentle and expansive “First Breath.” Peter’s piano playing here is absolutely gorgeous and I marveled at his ability to improvise such evocative melodies in the moment. There are a number of interesting role reversals from song to song as the album evolves. At times, the drone of Michael’s bass flute creates a foundation for Peter to improvise over. While on some tracks, Peter’s more sparse playing, as on “Midnight Dreaming,” holds down the fort, so to speak, as Michael weaves an enchanting spell on a higher-pitched Native flute. Throughout the album I appreciated the improvisational nature of the recording and an image came to mind of these two musicians as sonic surfers, waiting to catch the next wave of inspiration and riding it into shore, which they did on each of these heartfelt musical meditations. As mentioned, the separation between this world and the next is thinly veiled, and I appreciate Michael and Peter’s intention to musically explore this diaphanous realm. Heart Of Silence is perfect for meditation, relaxation, yoga, healing work, and more. The creative chemistry between Peter Kater and Michael Brant DeMaria is magical. They are both superb musicians in their own right, but what they have created together is as unique as it is transcendent. "Heart Of Silence" provides a dream-like voyage between the worlds that I’m sure many listeners will enjoy taking again and again.